The fifth edition of BE.BOP tackles central questions on Black European citizenship within global affairs. 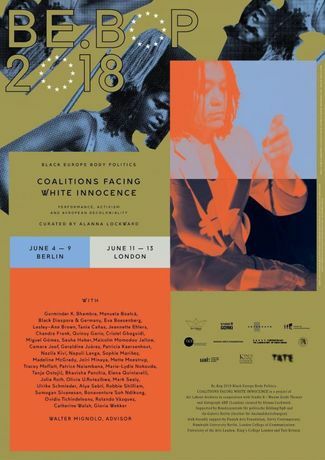 Incorporating a variety of disciplines & approaches - art, science, film, performance, activism - BE.BOP confronts colonial legacies & continuities with artistic strategies that enable the retelling of violent histories. During the performances and panel discussions, different initiatives from Europe, the African continent and its diasporas, and the Pacific region will present options to delink from coloniality. BE.BOP founder Alanna Lockward states in her introduction to this year’s catalogue: “If there is one word that takes a while to refer to in a negative way, it is ‘modern’. BE.BOP’s 2018 program reflects that terms like 'modernity', 'modernization', or 'civilization' and 'development' can be acknowledged as an epistemic trap of White Innocence. For centuries, these concepts have accumulated undeserved legitimacy at the expense of the colonial and imperial wounds they have inflicted. BE.BOP aims at contributing to possible alliances and coalitions between so-called ‘minorities’ while simultaneously promoting the critical self-reflection of educators, public institutions and cultural agents.